Chinese rail transit firm CRRC has unveiled a 30-meter long ‘smart bus’ or rather a combination of bus, tram and train rolled into one. The new vehicle is expected to speed up public transportation in the country. The developer describes the so-called Autonomous Rail Rapid Transit (ART) as a ‘railless train’ and it can carry 300 passengers in three carriages. Cars can be added or removed if needed. According to the manufacturer, the electric vehicle can travel up to 40 km on a full charge with a maximum speed of 70 km per hour. It runs on rubber tires and has sensors to read the dimensions of the road and plan its route. The idea is that the 'smart bus' could travel without a driver or rails. 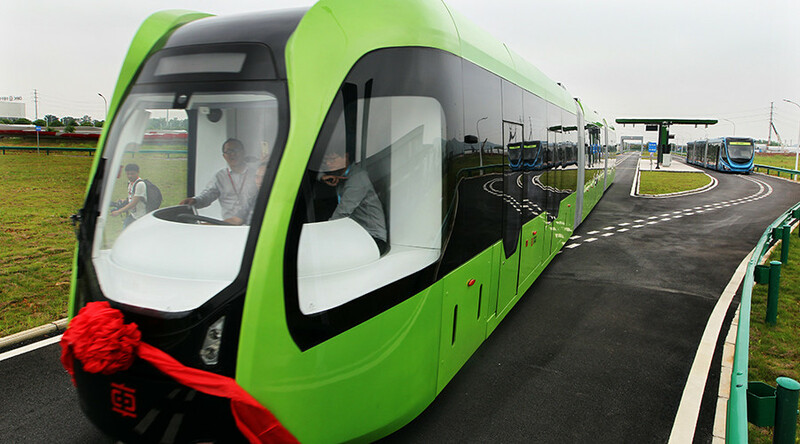 "It is like having a virtual rail for the bus," said Feng Jianghua, chief engineer of CRRC. The transit system was unveiled in Zhuzhou, in China's Hunan province is expected to be much cheaper than a subway or tram system since it doesn't require infrastructure to be laid down. It will be offered as a cheaper alternative to rail-based public transport as most medium-sized, and small cities in China can’t afford expensive subway systems. According to Xinhua, it costs up to $102 million to build a kilometer of a subway track, as compared to about $2 million for a standard length ART bus. A 6.5-kilometer demonstration route is due to open in Zhuzhou next year.